REUNION FLIER - PLEASE SHARE! 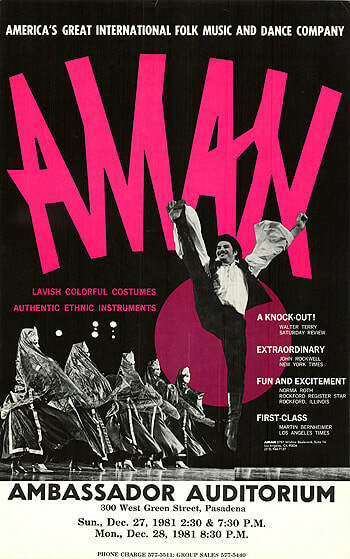 . . your web site for the latest and greatest news and information about AMAN alumni going's on. AMAN International Folk Ensemble; From our humble beginnings at UCLA in the early 60's as an extra curricular club to our triumphant performances as an important Los Angeles based performing ensemble on the stages of the Dorthy Chandler Pavilion, Radio City Music Hall, an in-residence gig at Epcot and tours of Utah, Arizona, Mid-West, Alaska and the even a trip around the Middle East. We all have a lot to be proud of, worthy of remembering and celebrating! * It's a fun group of people, engaging volunteerism... reconnect with your AMAN roots! 4 months (or so) in LA (attendance via Skype if outside SoCalif is ok). 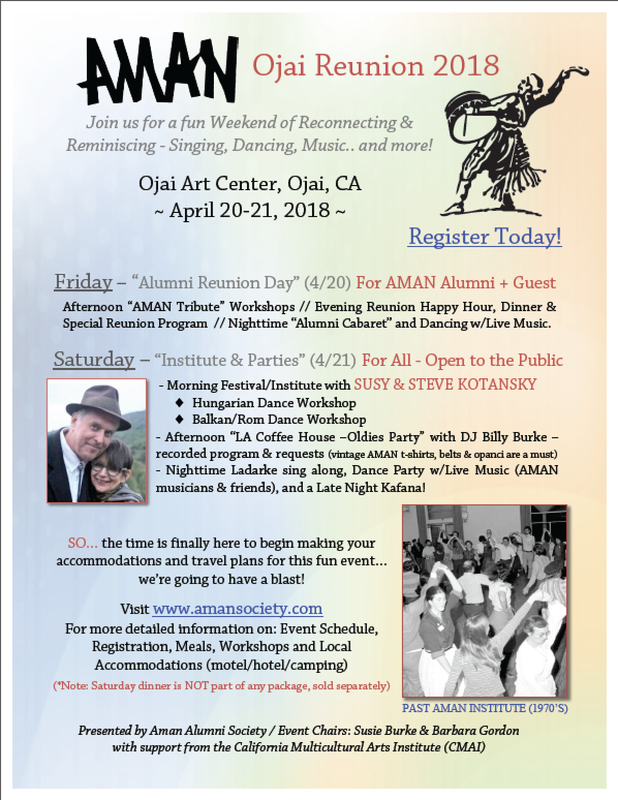 After so many years apart, a large group (300 strong) of AMAN alumni, friends and family were able to reconnect once again at the AM﻿﻿AN5﻿﻿0﻿﻿ Anniversary Reunion this past October 2013 in Palm Springs, California. And tho﻿﻿ugh we missed those not present, it gave us a chance to reconnect, pay tribute to our artistic creators, directors and to ourselves as dedicated performers, administrators and technicians. This "truly magical" weekend has spurred the feeling by many of the alumni and extended family that we need to try and keep this momentum going, stay connected with each other. We found that after the event it was hard to express to others (who'd not experienced all we did together in AMAN), just how much our fellow alumni and the weekend meant to us. How joyous and strong our connection was to each other at the reunion... it was palpable. So, with all that in mind we've created the "AMAN Alumni Society" web site where all AMANites, friends and family can continue to keep in touch into the future, see the latest and greatest about upcoming events and parties your hard working alumni committee might be planning. ONE YEAR LATER.. we gathered once more for another round of happy reconnecting at 'AMAN100' (wink-wink). Around 200 of our fellow AMANites friends & family came together for a little fun & frolic, cocktails & dinner, dancing & singing in the sun & sea air of Santa Monica. A good time was had by all.